Is It Worth The Wait In Line? Over this past year I've gone to several art exhibitions that, during the course of their runs, turned into high-profile "must see" events. Consequently, the exhibitions developed long waiting lines, which became stories themselves, which in turn generated even longer lines, and stories and social media moaning-and-groaning about the lines. Of course part of this might have to do with holding any public event in New York, but I think there's a bit more to it than that. How do people do the internal calculus to determine whether something is worth waiting in line for (sometimes for several hours)? The most popular way to decrease the Rain Room wait was to become a MoMA member --- it gave you preferential viewing times as well as shorter wait times than the general public. 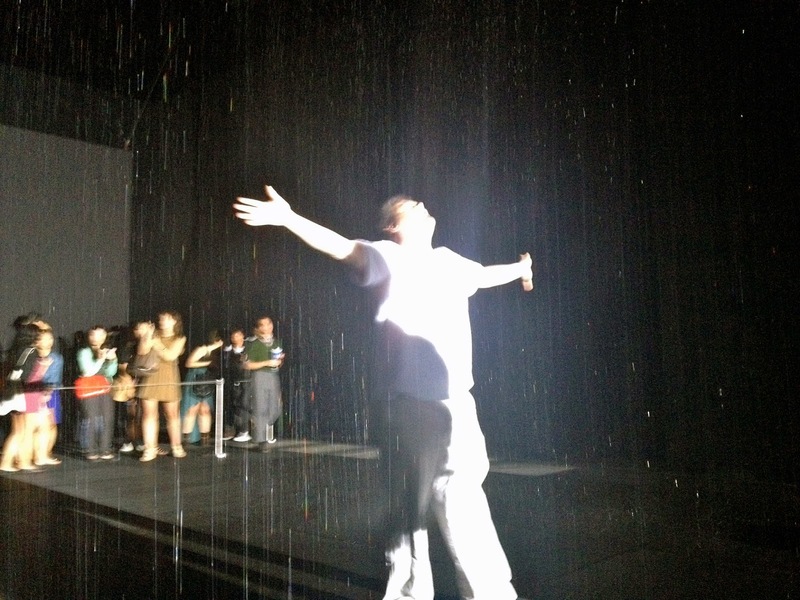 I'm sure MoMA's membership sales greatly increased during Rain Room! I ended up buying a family membership, and went to see Rain Room twice: the first time with a friend (before school let out) and we waited less than 90 minutes, the second time with my family (after school let out and closer to the end of the Rain Room run) which was nearer a three hour wait. In both cases, everyone I went with agreed it was worth the wait (even though the wait itself was not enjoyable.) I think waiting to see an unsual site-specific event/experience (Rain Room was built in a completely new structure on the street next to MoMA) as well as a social media campaign by MoMA that encouraged photography, tweeting, and tagging inside Rain Room gave people the fortitude to put up with the long waits. There was not quite the opportunity to say "I can come back to see this some other time." 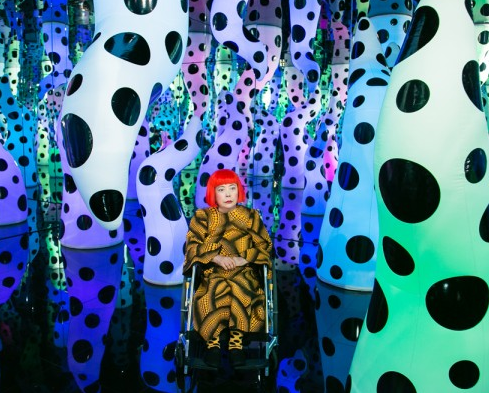 Almost every news story about the Kusama show became a story about the waiting lines. So the question is, were people visiting the Zwirner Gallery to see all the art work by Kusama, or merely to see (and take selfies inside) the infinity room that "everyone's been waiting six hours to see?" For myself and my friend we opted out of the super long wait, but did spend time inside the "Love is Calling"installation and also time viewing Kusama's wonderful paintings. Although it felt a little sad to be one of less than a dozen people inside the painting galleries, while hundreds of people waited hours outside in the cold to ultimately get only a 40 second peek inside the "The Souls of Millions of Light Years Away" piece. It felt like the Kusama paintings were superfluous to those people, that the status of getting that 40 second peek at that "thing in the news" was more important. I kept thinking about people who wait hours in line at an amusement park for a roller coaster ride that lasts just a minute or two. It seemed like the same thing.